Two teenagers arrested over a bottle attack on a man which left him with facial injuries have been bailed. 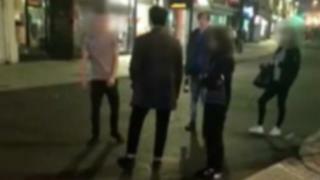 The South Korean student, who wants only to be known as Mr Kim, lives in Brighton and was attacked on North Street at 22:30 BST on 15 October. The 20-year-old had to be taken to hospital for treatment. A 17-year-old boy was arrested on suspicion of racially aggravated harassment, while a 16-year-old boy was held on suspicion of causing GBH. Sussex Police said both boys have been bailed until 11 November pending further inquiries.